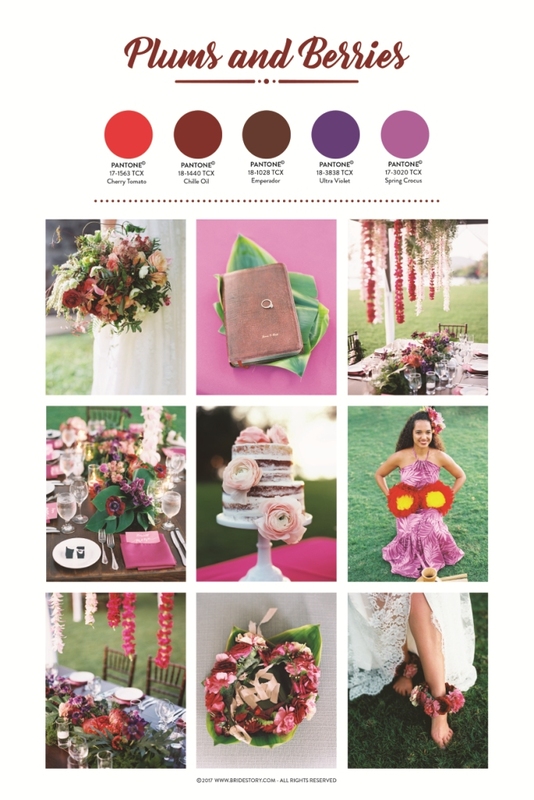 want a bit of wedding colour inspiration, read on! Want a bit of Wedding Colour Inspiration? Read on! If you are getting married in 2018, 2019 and beyond, have you chosen your colours yet, or are you struggling to decide? Or are you curious what other brides have chosen, or what the industry is predicting? Read on to find out more about 2018 and be inspired! First off, let's start with the colour experts, Pantone. Pantone's colour of the year for 2018 is Ultra Violet 18-3838. "Complex and contemplative, Ultra Violet suggests the mysteries of the cosmos, the intrigue of what lies ahead, and the discoveries beyond where we are now. The vast and limitless night sky is symbolic of what is possible and continues to inspire the desire to pursue a world beyond our own." Pantone's own words lend themselves seamlessly to the idea of a marriage, the union of two leading to the limitless possibilities for the future. But Pantone also has other predictions for 2018, and this is what the spring/summer range looks like, with loads of beautiful bright colours for the arrival of the blooms and warmer weather. According to Pantone, "The Spring 2018 palette encourages a sense of fun and playful release. With an air of complexity and distinctiveness, we find ourselves in a sanctuary of color that is ideal for some more unique and dramatic color mixing." This spring colour prediction is intended for the fashion industry, but then it inevitably weaves its way into other industries as a source of inspiration. Wedding specialists end up creating their own mood boards based on how they've been inspired. 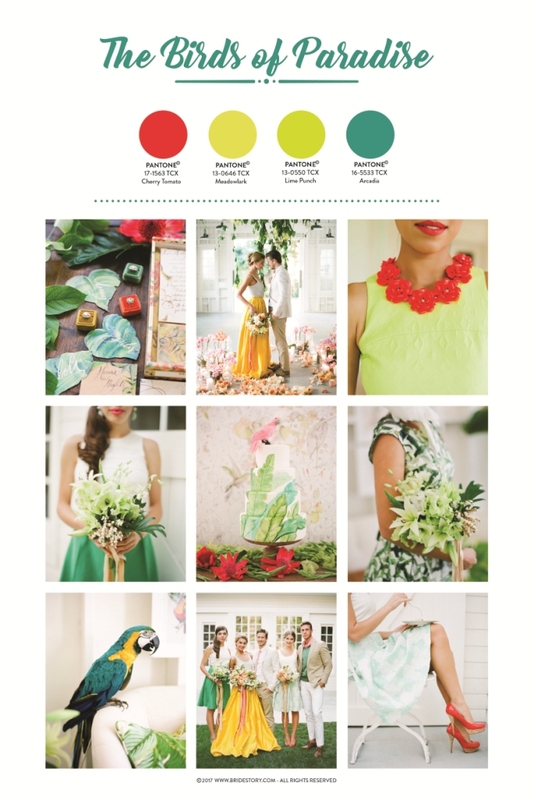 Here are some examples from Bride Story for Business, the online wedding directory and marketplace, who have created three colour boards on the theme of Tropical Weddings for spring 2018. Plums and Berries are mostly warm red-based colours, with the 2018 colour of the year Ultra Violet added in. Birds of Paradise is an explosion of the bright, vibrant and dashing, taking inspiration from exotic birds. Blushing Sunset is a softer and more subtle palette for a more romantic feel, still pulling in a little bit of a purple violet shade. And next, are three more examples from Magnet Street (provider of personalised wedding stationery amongst other things) for the summer of 2018 - I have picked only 3 stories from their 8 colour themes for the season, so check out their page highlighted above to see the other 5 and also for the other forthcoming seasons. Shine is based on sage green, with bits of rose, ivory and gold. The Rosy colour palette is based on a mauve rose, with peach, burgundy and metallic grey. The Oasis theme is a brighter palette, with a cheery lime green, and smaller accents of neutrals. What about autumn / winter for 2018/2019? Does purple appear in? Are the colours more toned down? At custom stationery makers Shutterfly, the autumn colours are orange-based, with orange reds, caramels, gold, mango, peach, cream, orangey autumn leaves colours, and accents of purple (of course), yellow and teal. Winter colours at Shutterfly are cooler, with lots of purple (in line with Pantone's colour of the year), hints of blues, pinks and berries. At the Bridal Consultant (specialists in destination weddings), the winter 2018 colours are deep and rich, navy and marsala, olive and black, plum and grey. Whether deeper, lighter, pinker, bluer, many of the colour mood boards shown above have a little purple influence. 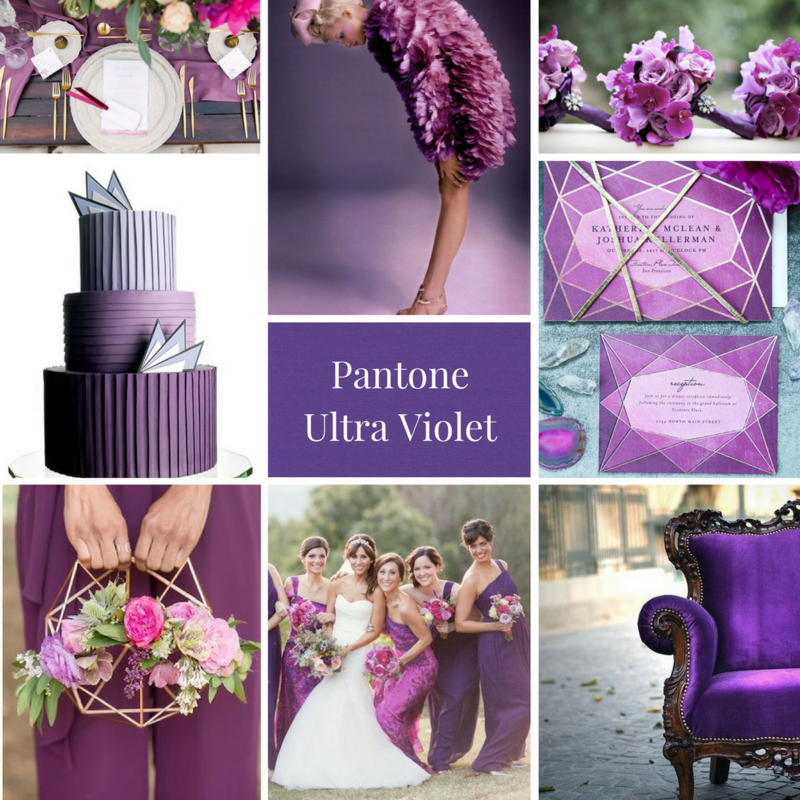 Ultra Violet may be colour of the year for Pantone, but, truth to be said, purple has always been a favourite for brides for many years. Ranging from lilac to deep aubergine, and for British couples, the famous Cadbury purple - purple turns up regularly as chosen wedding colours. Here's a little snapshot of real brides' wedding colours for 2018 and onwards. This word cloud was created out of responses from a Facebook post, and shows actual colour choices, as opposed to predicted colours. Purple is prominent (including Cadbury's, lilac, mauve, eggplant, royal, dark), as are many shades of blues (baby, aqua, electric, cobalt, navy, pastel, royal, sky, dusty) and shades of pink (baby, blush, dusty, fuschia, pastel, rose, vintage, watermelon, hot). 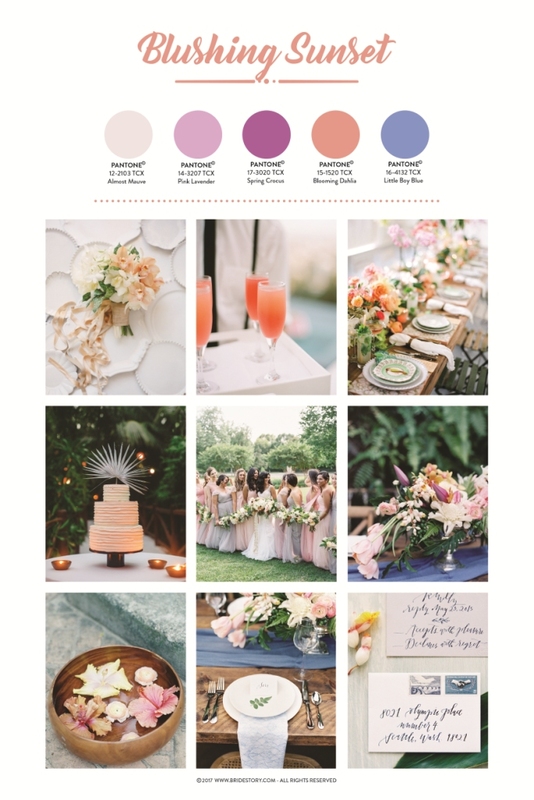 At the end of the day, whatever the colour predictions or colour trend, and no matter how much Pinterest and blogs can influence you, the colour theme for a wedding is very much a personal choice. And importantly, hopefully an agreed joint choice! Hope you enjoyed this blog, and do share with us your own wedding colours. With the exception of the Word Cloud, sources and Images from: Pantone, Hanami Dream, Bride Story for Business, Perfect Wedding Guide, Shutterfly, Bridal Consultant and Magnet Street. All links in the Blog text above. Do visit them for more images and inspiration on colour. Blue Lily Magnolia makes bespoke and unique accessories for special occasions, including for brides, bridesmaids, grooms and groomsmen. If you would like to create a one of a kind piece for your wedding in the colour of your choice, get in touch for a friendly discussion.